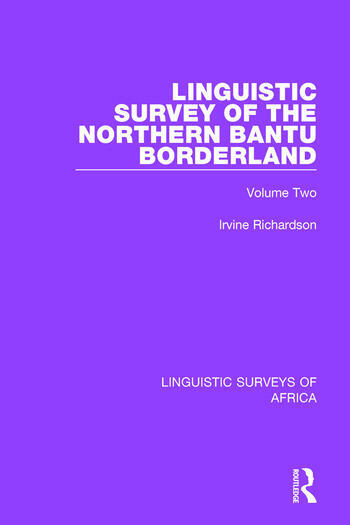 This volume, originally published in 1957, contains the linguistic evidence for the classification of the languages encountered by the western team of the Northern Bantu Borderland Survey. To appreciate fully its implications it should be read in close conjunction with the appropriate sections of Volume 1 of the Survey, dealing with the demography of this area. The inclusion of some languages over others in this volume in no way reflects its demographic or linguistic importance, but simply indicates that the evidence was available to the Survey. The material is original and except where otherwise indicated was taken down by the team in phonetic script from local informants in situ. Introduction. 1. Bantu Languages 2. Bantoid Languages 3. Non-Bantu Languages.